BOCA RATON, Fla., April 15, 2019 /PRNewswire/ -- Trio Sana showcased its two revolutionizing supplements for joints and anti-aging and the first of its high quality organic essential oils at the Weight Management, Sports Nutrition, Vitamin & Hemp Solutions EPPS conference in Orlando. From March 31-April 3, the company spoke one-on-one in private meetings with major retail buyers including some of the top outlets in the nation such as CVS, The Vitamin Shoppe, Whole Foods Market, GNC, Kinney Drugs and Wegmans. "We are quite excited about the response from the buyers who saw our products and we think the public will love them just as much," said Peter Cobain, co-founder of Trio Sana. "We plan to bring the Kollagenix and Frankincense products to the American consumer this year. Meeting with so many different outlets this month was a great start." 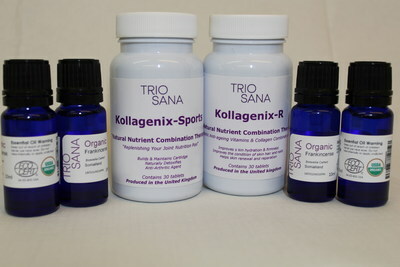 Kollagenix-Sports, which was developed by using Trio Sana's Natural Nutrient Combination Therapy (NNCT) technique. This process combines marine collagen with the three vital nutrients for joints and muscles to work synergistically together which maximizes their effectiveness in injury prevention and improves recovery time. Kollagenix-R, which also employs NNCT, uses marine collagen and combines it with 13 anti-aging vitamins to create a supplement that helps slow down visible aging effects by ensuring that the "reserve collagen pool" is maintained. Certified NOP Organic Frankincense Boswellia Carterii from Somaliland, which is known for its therapeutic health benefits. Recent research suggests that Frankincense may help reduce stress, boost the immune system, prevent signs of aging and ease digestion. "We continue to look forward to expanding our distribution network in 2019," Cobain said. Efficient Program Planning Sessions (EPPS) is a branch of the Efficient Collaborative Retail Marketing (ECRM®) event series where brands can have direct discussions with major retailers and others about business objectives, such as product launches, marketing campaigns and more. For any additional information about Trio Sana's products, call 561-544-0719.